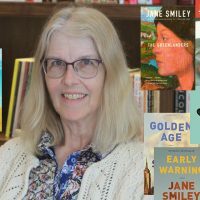 Introduction to Jane Smiley. 3:00 min. Photo & Design: Raymond Elman. Video Montage: Jade Cheek. Music: Hard Times Come Again No More · Stephen Collins Foster · Alisa Jones Wildwood Flower. Jane Smiley (b.1949) was born in Los Angeles, California, and grew up in Webster Groves, Missouri, a suburb of St. Louis. She obtained a BA in literature at Vassar College, then earned an MA, MFA, and PhD from the University of Iowa. While working toward her doctorate, she also spent a year studying in Iceland as a Fulbright Scholar. From 1981 to 1996 she was a Professor of English at Iowa State University, teaching undergraduate and graduate creative writing workshops. In 1996, she moved to mid-coast California. To say Jane Smiley is prolific is an understatement. She has written 14 novels, 2 collections of short stories, 5 works of non-fiction, and 5 books for young adults. Smiley published her first novel, Barn Blind, in 1980, and won a 1985 O. Henry Award for her short story “Lily,” which was published in The Atlantic Monthly. Her best-selling A Thousand Acres, a story based on William Shakespeare’s King Lear, received the Pulitzer Prize for Fiction in 1992. It was adapted into a film of the same title in 1997. Her novella The Age of Grief was made into the 2002 film The Secret Lives of Dentists. Smiley’s Thirteen Ways of Looking at the Novel (2005), is a non-fiction meditation on the history and the nature of the novel. In 2001, Smiley was elected a member of The American Academy of Arts and Letters. She has participated in the annual Los Angeles Times Festival of Books, the Cheltenham Festival, the National Book Festival, the Hay Festival of Literature and the Arts, and many others. She won the PEN USA Lifetime Achievement Award in 2006, and chaired the judges’ panel for the prestigious Man Booker International Prize in 2009. Smiley’s most recent works are a trilogy of novels about an Iowa family over the course of generations. The first novel of the trilogy, Some Luck, was published in 2014 by Random House. The second volume, Early Warning, followed in the spring of 2015, and the third volume, Golden Age, in the fall of 2015. In 2017, FIU presented Smiley with the Lawrence Sanders Award in Fiction. INSIGHT & INSPIRATION: 4:26 min. What is your earliest memory of enjoying reading, and thinking you might want to write some day? Do you impose a similar process on all of your writing projects, or does the project tell you how it wants to be written? VALUES PRODUCTION PROCESS: 3:04 min. You use the horse business as a metaphor for writing. INSIGHT & INSPIRATION: 2:24 min. What kind of horses did you raise? You write both fiction and non-fiction. Do you have a preference? EXPOSURE TO BROAD INFLUENCES: 3:58 min. How did growing up in St. Louis effect you and your work? Why did you decide to attend Vassar College? VALUES PRODUCTION PROCESS: 3:35 min. Can you talk about your experience with the Miami Book fair? INSIGHT & INSPIRATION: 3:06 min. What are your criteria for taking on a project? Is there anything about you that people don’t get or understand?